This house / villa , with a land size of 2000 m² (about 0,49 acres) comprises 14 rooms including 6 bedrooms, 2 bathrooms and 2 toilets. It is provided with a living room, with dining room, with a terrace and with a garage. Totally renovated Others : fireplace. In a quiet environment , this house / villa (farm building) , with a land size of 5500 m² (about 1,36 acres) comprises 12 rooms including 3 bedrooms and 1 toilet. It is provided with a living room, with a terrace, with a garage and with a cellar. Others : fireplace. This house / villa has 9 rooms. It has a garage, a cellar and a parking lot. Superb fully modernised Fermette located 5mn from Hesdin and its town centre, 60mn from Calais with modernised converted barn made up of a large room built as a cinema, plus a large double guest bedroom, and a smaller room. The property includes fully fitted tiled kitchen, cellar, dining room, two living rooms, four bedrooms with exposed original beams, landing with separate toilet, fully tiled bathroom. Garden of 580 sq metres with workshop and greenhouse. . New electrics and plumbing, mains sewerage connected. In the Ternoise Valley, a few minutes drive from Anvin and its shops, large character property set on a superb landscaped park of more than 2,5 acres, bordered by the river (120 meters). It comprises of: entrance hall, fitted kitchen, living room with log fireplace (33sqm), 2 bedrooms downstairs and 1 upstairs, bathroom, utility room, 2 garages. Huge loft to convert of 80sqm. Oil fired central heating, double glazing windows, septic tank. Rare on the market, viewing recommended. Nice renovated brick farmhouse, 5mn driving from Frévent and its shops, 1 hour from the coast, 90mn from Calais and Lille. It includes: living/dining room with large open fireplace, oak fitted kitchen, leading onto a lovely landscaped garden, bathroom, 4 bedrooms, garage, several sound outbuildings offering possibility of conversion into extra dwelling/gite, garage, nice closed courtyard, terrace, oil central heating and mains drainage. Lots of charm. This house / villa comprises 6 rooms including 3 bedrooms, 1 bathroom and 1 toilet. It is provided with dining room and with a terrace. Heating : underfloor. Others : fireplace. Massive stone built property situated near shop and schools and 9 kms drive to Valognes. dining room of 18 m² with mezzanine of 12 m² used as study. 3 bedrooms of 15 m², 9 m² and 12 m². Attached to the house : double garages with attic for storage, wooden shelter. Large patio with West facing and bower. Nice garden and field with green house. Electric heating and septic tank. Near the beach, large modern house with basement. 5 bedrooms. Garden of 758 m². Attic converted into a small single bedroom. ON Basement: Garage, 2 bedrooms of 11 m² each with washbasin and shower room comprising shower and WC. Wooden built modern house of 150 m² habitable, situated 6 kms to the beach. 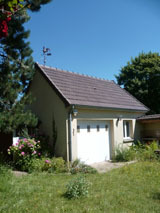 Independent garage of 25 m² with electricity supplies. 100 m to the beach, modern house on one level with garden of 787 m². 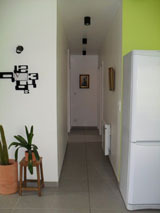 2 bedrooms of 12 m² each and other one of 10 m², bathroom comprising bath, washbasin, Italian shower, separate WC. This house / villa , with a land size of 1150 m² (about 0,28 acres) comprises 6 rooms including 3 bedrooms, 1 bathroom and 1 toilet. It is provided with a terrace and with a garage. This house / villa (contemporary house) , with a land size of 1300 m² (about 0,32 acres) has 16 rooms including 6 bedrooms, 1 bathroom and 2 toilets. It has a living room, a terrace, a garage and a cellar. Others : fireplace.